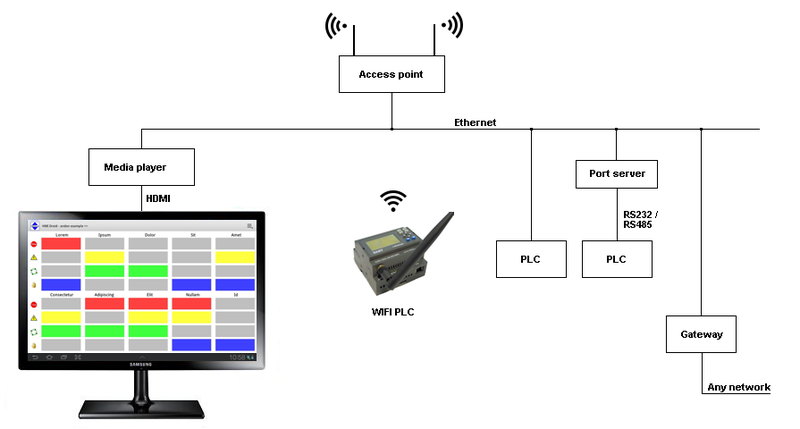 Communication over Wi-Fi between a mobile device with HMI Droid and the PLC either directly (eg Modbus/TCP or Siemens S7 Communication) or through a serial port via a port server (eg COMLI or Modbus RTU). Link preferences should be set to Wi-Fi, or Ethernet UDP when using SattBus COMLI. Port server tested with HMI Droid and works well is MOXA NPort 5110. 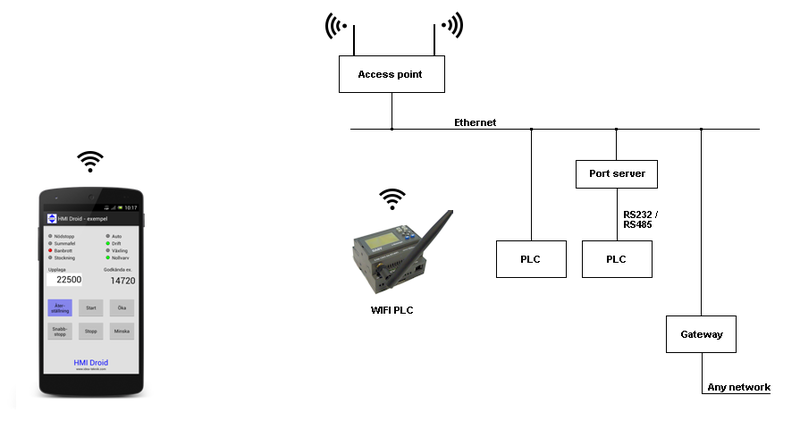 Communication over mobile internet between a device with HMI Droid and the PLC either directly (eg Modbus/TCP or Siemens S7 Communication) or through a serial port via a port server (eg COMLI or Modbus RTU). Link preferences should be set to Wi-Fi, or Ethernet UDP when SattBus COMLI, no matter how Android device connects to the internet. Router configured for "port forwarding". If the IP address on the Internet is not fixed, you can use a dyn-dns service. Using a VPN tunnel is recommended. Many routers and NAS devices have built-in VPN servers that are easy to setup. 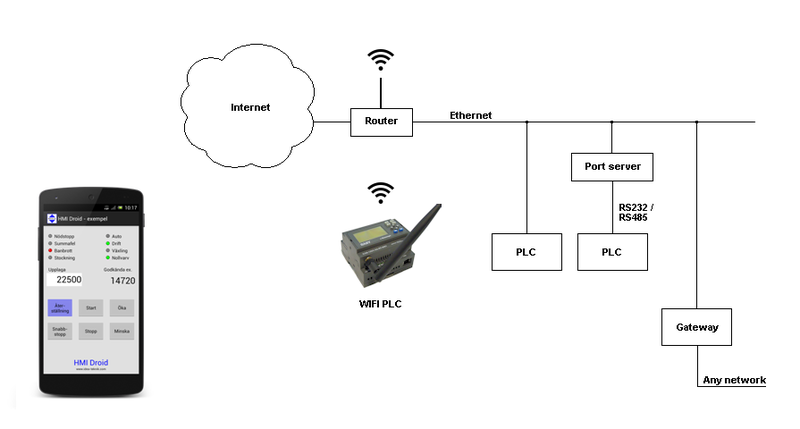 Communication over ethernet between panel PC, ODROID or Raspberry Pi with HMI Droid and the PLC either directly (eg Modbus/TCP or Siemens S7 Communication) or through a serial port via a port server (eg COMLI or Modbus RTU). 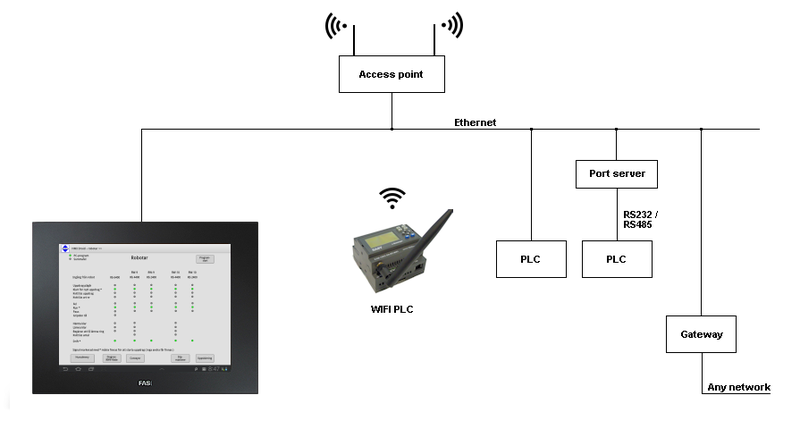 Communication over ethernet between a media player or a PC with HMI Droid and the PLC either directly (eg Modbus/TCP or Siemens S7 Communication) or through a serial port via a port server (eg COMLI or Modbus RTU). Note: There is no support for Bluetooth SPP in the iOS-version of HMI Droid. 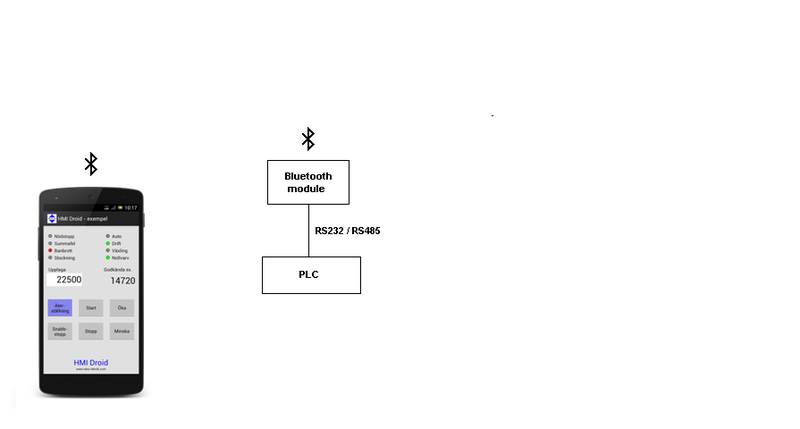 Bluetooth® brands and logotype are registered trademarks of Bluetooth SIG, Inc.